Home > Local News > Shorebirds migrate through Vt. The beginning of September marks a unique birding opportunity in Vermont. 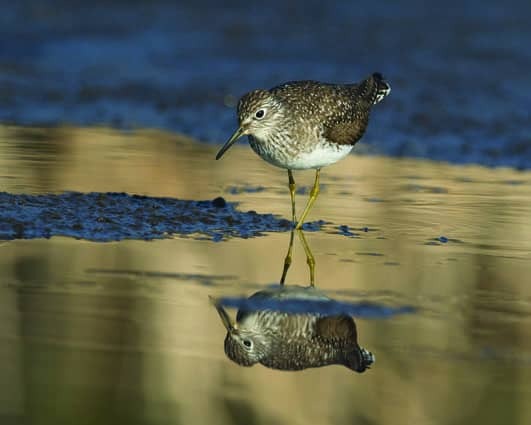 Shorebirds such as plovers and sandpipers are migrating through the state on their southern journey from northern Canada to the Caribbean and beyond. One of the best places to spot shorebirds this time of year is at Dead Creek Wildlife Management Area in Addison, Vt.
“The lack of rainfall has led to low water levels this year providing ample habitat for shorebirds, particularly along Lake Champlain,” said John Buck, migratory bird biologist for the Vermont Fish & Wildlife Department. More photos by Ians Clarks are available at www.IanClark.com. A Solitary Sandpiper stands in shallow Vt. waters.